Have to Get It Right! Want to know what you need to do (and, if you are anything like me, you’re probably not doing it very well at all.) Read Matthew Chapter 5. You know, the one with the beatitudes, plucking out eyes and cutting off hands, and anger, and adultery, and divorce, and swearing, and retaliation, and loving one’s enemies. One can’t read this Chapter without realizing what little worms we are when it comes to the whole perfection thing. I read Chapter 5 before and after going to confession. This and Chapter 25 are all I need to trot myself off to the confessional. Add the corporal and spiritual works of mercy, and I can go all gooey on the inside contemplating my long stay in Purgatory. God gives us grace and forgiveness and mercy to help us to prioritize the pursuit of holiness in our lives. Pursuing holiness begins with having a strong, true, and ardent love for God and for our neighbor. It means praying and fasting and making each word and act and little daily sacrifice the means of proving our love for our Savior who died on the cross for Love of us. An effective love can transform a dry, cold heart into a furnace of charity. Then we can burn with Love of God even while we must live here below. I hope you, like myself, pursue this ardent charity. We got to get this right. “Lord, with your loving care, guide the penance we have begun. Help us to persevere with love and sincerity. Grant this through our Lord Jesus Christ, Your Son, Who lives and reigns with You and the Holy Spirit, one God, for ever and ever. Amen.” Liturgy of the Hours: Evening Prayer for the Friday after Ash Wednesday. Just finished reading Chapters 3 and 4 of Matthew’s Gospel. There is so much there that it would take pages to discuss. 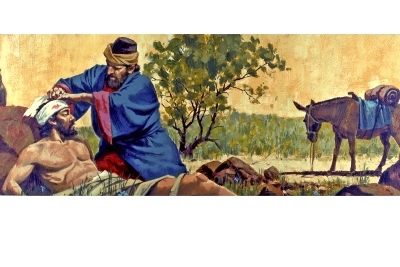 It is about His baptism by John and His temptation in the desert. Satan was tempting Jesus’ identity as the Son of God. He wants Him to embrace an earthly and political mission and thus subvert from His real mission of suffering and dying for our salvation. 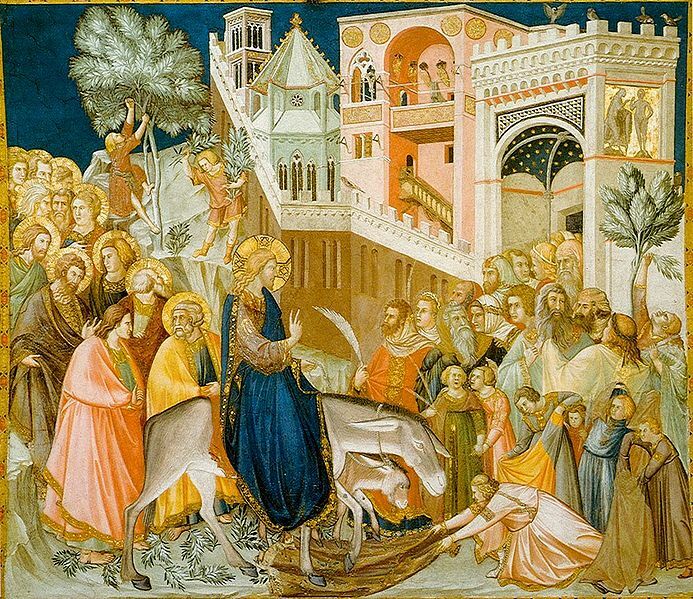 According to St. John Chrysostom, Jesus gives us a perfect example of Christian obedience. Earthly life is our wilderness. Our goal is to get to the “land” of heaven. This life is like a probationary period for us. God wills that we overcome temptations (from the world, the flesh, and the devil) through the practice of penance and obedience to God’s word. We must desire Christ’s humility. And this is how we can increase the gift of righteousness: penance, obedience, and humility. Righteousness is a gift from God. The word itself is used 7 times in Matthew and 85 times in the rest of the New Testament. Christ first gives us this gift in Baptism when we are restored in our relationship as an adopted son or daughter of God. It always means (from the Greek) the uprightness and faithfulness of God and His people. It is part of the unique covenant vocabulary that runs throughout the old and new testaments. God’s righteousness is because He is holy and is revealed as He takes care of Israel. Now, He has demonstrated His righteousness through the saving work of His Son, Jesus Christ. Jesus wants us to be righteous, like He and His Father, are righteous. And, I might add, fill you with righteousness. Finally, He exhorts us to sanctity. We have to face the fact that only by being holy as the Father is holy will we enter into heaven. He is the fountain of life and grace; of strength and holiness. He has already merited everything that serves for our sanctification; His gifts are unnumbered, yet we can not become saints unless we co-operate with Him. Sanctity is the fullness of grace. Jesus wills this for all of us. Then, why are so few of us saints? Why am I not a saint? Sanctity is not obtained by our accomplishments or the number of gifts we have received from God. Rather it is in the degree of sanctifying grace and charity to which our souls have attained by cooperating with His many invitations, inspirations and actual graces. The gifts of Baptism and the Holy Spirit and all the sacraments should have already increased our treasure trove of grace. And, yet, we remain slothful, prideful, and stingy. It didn’t escape my attention that Luke’s chapter 21 begins with the Widow’s mite–extreme charity from extreme poverty. What a lesson for us to begin this Advent season. If we are to prove to Jesus that we are sincere about becoming holy, we need to, with His help, be very, very generous. We need to overcome our selfishness and attachment to things no matter what it costs us. We need to say a resounding “yes” to Him even when we would rather let our “hearts be weighed down with dissipation and drunkenness and cares of this life.” Luke 21″ 34 We must not grow lazy in our pursuit of sanctity. Have a blessed Advent. Pursue sainthood with fervor! No Matter What the Consequences! “Hear as Jesus heard; speak as Jesus spoke; suffer as Jesus suffered; die as Jesus died; rise as Jesus rose.”–One Bread One Body for Wednesday, March 27, 2013. I have been sitting here with pen poised trying to visualize what this day would have looked like for Jesus and His disciples. Was there an aura of intrigue about the temple and were they aware of it? Had the disciples relaxed a bit because of the Hosannas ringing out when Jesus entered Jerusalem a few days before? Were they watchful and anxious or just “hanging out” with Jesus? Beginning Thursday evening, they will fall asleep, betray, flee, deny, despair, and hide. I think I’m “hanging out” with Jesus after this post until Saturday afternoon. I’m praying that I won’t fall asleep, betray, flee, deny, despair, and hide. What about you? Well, today, we study the final 9 verses of the Sermon on the Mount: Matthew 7: 21-29. I have learned much during this study. Hope you have, too. 7:24 like a wise man: true wisdom puts Jesus’ teaching into practice and prepares for the future. his house: Physically, this parable alludes to building in New Testament Palestine. Mud-brick houses were generally built in dry season. Only a house with a solid foundation would resist erosion and destruction when torrential rains came. Jesus’ reference to a wise man and his house is a reference to King Solomon who built the temple upon a great stone foundation. Morally, the enduring house is the soul that is maintained only through labor and the materials of prayer and virtue grounded on Christ. The Ten Commandments, the Sermon on the Mount, Matthew 25: these are all part of Jesus’ blueprint for Holy living. I know that I will continue to read and ponder them often during this pilgrimage to heaven. Have a blessed and holy Triduum and a Joyous Easter! I love this passage from John. It makes me think. “Am I willing to give everything I have and everything I am to Jesus without counting the cost?” Good question to think about during Holy Week. Now to the second last section of the Sermon on the Mount. 7: 11 you then, who are evil: Jesus indicates the pervasive sinfulness of man. good things: the material necessities of life as well as the grace to live as God’s children. Study Question: In Catholic Tradition, what is sanctifying grace? Meditation: Am I ready to carry my small sharing in the Cross of Jesus? At the beginning of Chapter 6, St. Matthew writes about the Lenten Big Three: Almsgiving, Prayer & Fasting. Let’s see what he has to say, shall we? (CCC 1969) the new law practices the arts of religion: almsgiving, prayer, and fasting, directing them to the “Father who sees in secret” in contrast with the desire to “be seen by men.” Its prayer is the Our Father. He who has two coats. let him share with him who has none; and he who has food must do likewise. But give for alms those things which are within, and behold, everything is clean for you. (6: 5-15) The Our Father is such an important prayer, that my Wednesday blog will cover this alone. Study Question: How is the Our Father divided? What are the 7 petitions? Conclusion of Chapter 5: 33-48 Probably the Toughest! Next week, we will pick up the Sermon on the Mount in Chapter 6. We are moving right along as we are over half-way through Lent. It’s “gut-check” time. Is our Lent helping us to get holy? Are we praying, fasting, and giving alms (practicing works of mercy?) Are we rushing less and reading more? Are we getting to know Jesus; so we can better know the Father? Are we attending Mass more often? Have we gone to the Sacrament of reconciliation, yet or planning to go soon? Or is it time for a course correction? There’s plenty of opportunity to turn things around. (5:33) not swearing falsely: Jesus forbids private oath swearing. In the context of a public oath, God’s Holy Name is invoked to bring blessing to the upright and curses to those who violate their oaths. Evidently, during Jesus’ time, people swore by heaven, hell, and Jerusalem (5: 34-35) for their own personal advantage and therefore, did not take their oaths seriously. (5: 37) Let what you say be simply “yes” or “no”; anything else is from the Evil One. (5:38) an eye for an eye: Jesus forbids the misuse of Mosaic Law to justify private vengeance. Exodus 21:24 was meant to limit retribution; (cf. Lev. 24-20; Deut 19: 21) The punishment had to fit the crime and not exceed it. Jesus eliminates a policy of retaliation from personal life. (cf. Rom 12: 17) Repay no one evil for evil, but take thought for what is noble in the sight of all. (5: 41) if any one forces you: Roman soldiers in NT Palestine could recruit and compel Jews into temporary service. (i.e. Simon of Cyrene in 27: 32) Jesus wants ungrudging generosity beyond the call of duty. (5: 43) Jesus considers this one of the two great commandments of Mosaic Law. Unfortunately, the Jews had a very narrow definition of “neighbor.” It had to be someone exactly like them. (CCC 1933) hate your enemy: Israel’s warfare laws were meant to wipe out Gentiles so the Jews wouldn’t imitate their idolatry. Jews in NT Palestine disdained the Gentiles that lived among them. Jesus broadens the definition of neighbor to include the Gentiles; even the Romans. (Lk 6: 36) Jesus gives holiness a new focus, defining it as mercy that reaches out to others. 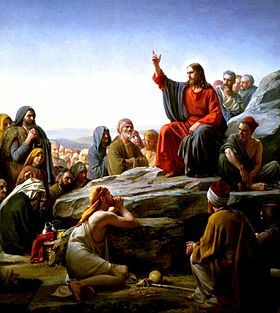 (CCC 2842) . . .it is impossible to keep the Lord’s commandment by imitating the Divine Model from outside; there has to be a vital participation, coming from the depths of the heart. . . So there you have it: chapter 5 of the Sermon on the Mount. This is Jesus’ recipe for a good and holy life here on earth and an eternity with Him in Heaven. 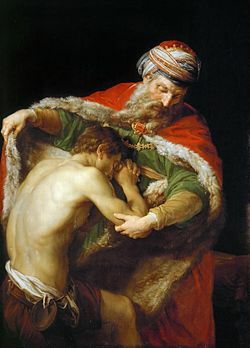 Let us pray that we will hold Him and His precepts in our hearts and live the two greatest commandments as He explains them in St. Matthew’s Gospel. Study Question: (CCC 1933) How does this explain our duty to expand our definition of who is our neighbor?